A Tonk's Tail... err, Tale...: Hello, Spring? 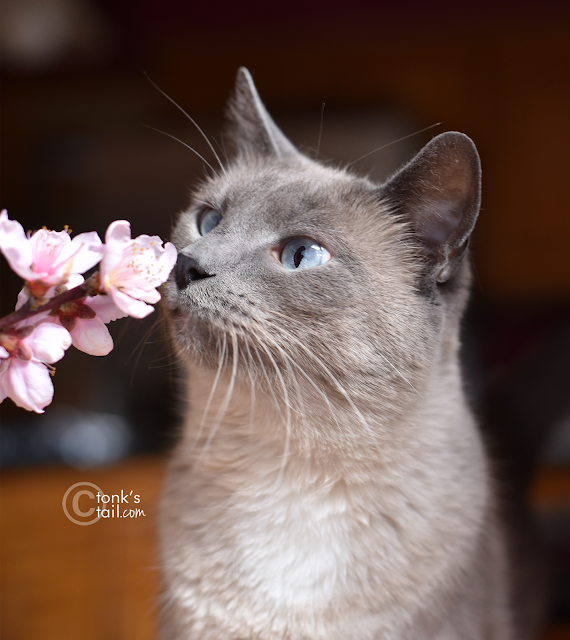 Maxwell: Today's the first day of spring, and I'm stopping to sniff the flowers, boy. Faraday: But it's still elebenty degrees below warmz, and the snow JUST melted. I don't see no stinkin' spring anywheres. (disgusted snort) You'd think it got losted or something. Maxwell: ...which is why I'm sniffing the peach blossoms from three years ago, dood. Faraday: You can't do THAT. Even I know flowers don't last that long, Maxie. Maxwell: Ever heard the saying, "take a picture, it'll last longer"? You just keep sniffing the flowers dude! MOL! Spring just isn't happening there, we take it. Here, it's been so windy, any hint of Spring has been blown off somewhere over the Pacific Ocean by now. And cold weather returns by Friday. Spring, someone said? Yeah, sure, right. MOL! It's drizzly here, so we aren't sure spring has arrived either. Spring hasn't really arrived here either, it never arrives in Michigan until May lol. I DO love your spring-like photos though! There are some cats you just can't teach, Maxwell. Maxie, you look very, VERY handsome with your flower! Spring can be a mental season, you know! Those pictures are just breathtaking! That is why mum keeps fake flowers in the house. Then she always has something pretty to look at. Plus lots of pics too. Our spring is pretty cool too, and a lot of snow is still hanging around. When the sun does come out, we do feel how strong and warm it is. We sure hope spring REALLY arrives there soon, pals! Very sweet photos indeed. Happy Spring y'all.